A: DVD is an optical disc storage format, invented and developed by Philips, Sony, Toshiba, and Panasonic in 1995. DVDs offer higher storage capacity than Compact Discs while having the same dimensions. Pre-recorded DVDs are mass-produced using molding machines that physically stamp data onto the DVD. Such discs are known as DVD-ROM, because data can only be read and not written nor erased. Blank recordable DVD discs (DVD-R and DVD+R) can be recorded once using a DVD recorder and then function as a DVD-ROM. Rewritable DVDs (DVD-RW, DVD+RW, and DVD-RAM) can be recorded and erased multiple times. DVDs are used in DVD-Video consumer digital video format and in DVD-Audio consumer digital audio format, as well as for authoring AVCHD discs. DVDs containing other types of information may be referred to as DVD data discs. Any DVD Cloner, Any DVD Cloner Platinum, Any DVD Cloner Express are easy-to-use and powerful DVD backup software for differnt customers with various needs. How about ripping DVD? 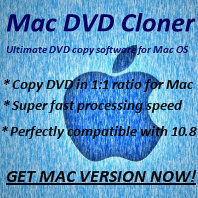 Easy as long as you own Any DVD Cloner Platinum - all-in-one DVD cloner and DVD ripper.